This is an Edwardian (circa 1910), mahogany chest of drawers. 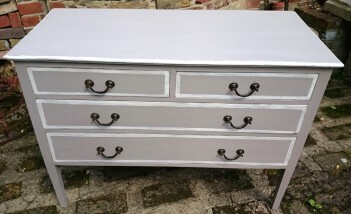 We have fully restored it, meaning that all the drawers run properly and handpainted it using Grand Illusions Vintage Paint in Pastille beige and Sel de Mer white. We have gently distressed the white areas and then varnished it for durability. The chest retains its original handles.